FERGUSON, MO. (AP) — Flames engulfed at least a dozen businesses in Ferguson early Tuesday and gunfire kept firefighters at bay after protests over the decision not to indict a police officer in Michael Brown's death turned violent, despite pleas for peace from Brown's family and others. Protesters smashed windows out of police cars and buildings, several of which were later looted and set ablaze, and officers lobbed tear gas from inside armored vehicles to disperse crowds in scenes reminiscent of the early days of unrest that followed the Aug. 9 shooting. But the violence that followed Monday's decision to not indict Officer Darren Wilson, who is white, in the death of the unarmed black 18-year-old quickly took a more destructive turn — a storage facility, two auto parts stores, a beauty supply store and pizza shop were just some of the businesses that burned. An Associated Press photographer saw firefighters arrive at one scene only to be turned back by gunfire. St. Louis County Police Chief Jon Belmar said during an early morning news conference that he "personally heard about 150 shots fired" during the course of the night, but said police did not fire a shot. He said most of at least a dozen burned businesses were "total losses" and noted two police cars were "basically melted." "I don't think we were underprepared," Belmar said. "But I'll be honest with you, unless we bring 10,000 policemen in here, I don't think we can prevent folks who really are intent on destroying a community." Smashed window glass littered the sidewalks around many other businesses, from mom-and-pop shops to a McDonalds along the main drag. The Ferguson Market — where surveillance video had recorded Brown stealing cigars minutes before he was killed — was ransacked. At least one building and several vehicles in a used car lot also burned in the neighboring city of Dellwood. The vast majority of protesters had left the streets by late Monday, but looting and gunfire still were reported well after midnight. Hundreds of people had gathered outside the Ferguson Police Department ahead of St. Louis County Prosecutor Bob McCulloch's news conference to announce the grand jury's decision. As McCulloch read his statement, a crowd gathered around a car from which the news conference was broadcast on a stereo. 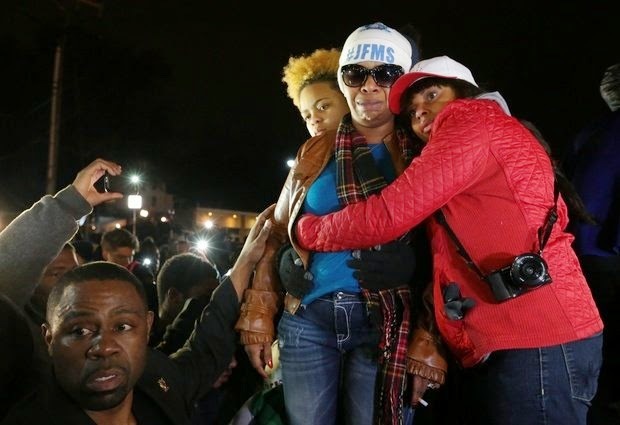 Brown's mother, Lesley McSpadden, sat atop the car. When the decision was announced, she burst into tears and began screaming before being whisked away by supporters. A short time later, Brown's family issued a statement asking people to keep their protests peaceful, echoing pleas they had issued several times in the days and weeks leading up to the decision. "Answering violence with violence is not the appropriate reaction," the statement said. But some protesters overran barricades and taunted police. Some chanted "murderer" and others threw rocks and bottles. The windows of a police car were smashed and protesters tried to topple it before it was set on fire, though some in the crowd tried to stop others from taking part in the violence. Officers responded by firing what authorities said was smoke and pepper spray into the crowd. St. Louis County Police later confirmed tear gas also was used.